He apparently intends to claim that he’s the victim in the relationship and was defending himself. Mandla “Mampintsha” Maphumulo has been granted bail of R2,000 in the Pinetown Magistrate’s Court. He will reappear in court on 15 May. The magistrate instructed him to avoid any contact with his accuser. He was reportedly suffering from a foot injury in court. 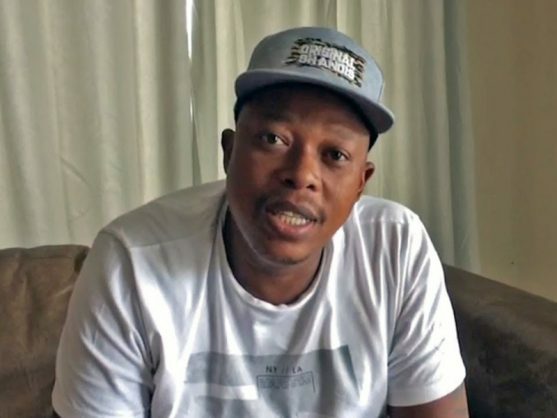 In a new twist on Tuesday afternoon, Mandla “Mampintsha” Maphumulo’s lawyer has said that his client is in fact the victim following outrage at a video clip showing Maphumulo appearing to hit partner Babes Wodumo, real name Bongekile Simelane. The under-fire Kwaito musician has apparently also laid counter-assault charges against the Gqom singer, claiming the widely publicised Instragram video showing him slapping her several times was in fact him defending himself, his lawyer said on Tuesday. Speaking to eNCA outside the Westville Police Station in Durban where Mampintsha had handed himself over to police custody after Wodumo, laid a common assault charge against him, lawyer Pat Magwaza said: “He was assaulted so he has opened a case of assault against Bongisile Simelane. He said his client did not “take this well because it looks like a setup”. In the live Instagram feed on Sunday night, Mampintsha can be seen hitting Wodumo who is shown sobbing and cowering in apparent fear. Magwaza said Mampintsha was expected to appear in court this afternoon. The South African Police Service (SAPS) confirmed earlier today that he was arrested after Simelane laid an assault charge against him yesterday. Mampintsha has opened a counter charge against Babes WoDumo according to his legal representative Mr. Magwaza. Apparently he went a night before the assault to Westville Police station to write a statement that he was being abused. Don't expect a desired justice from this case. Mampintsha has cunningly laid a counter charge against his girlfriend! Brigadier Vishnu Naidoo confirmed the news when approached by The Citizen. This followed an earlier search for Maphumulo, who was reported missing this morning. Police commissioner General Khehla Sitole was interviewed on SABC’s Morning Live, where he gave the police three hours to find and apprehend producer and Kwaito musician Mandla “Mampintsha” Maphumulo. This three-hour deadline began at 7am and ended at 10am. An Instagram Live video, posted by Simelane, in which she can be seen being beaten, allegedly by Mampintsha, has caused widespread shock and outrage. The Citizen reported yesterday that Simelane was seen at the Westville Police Station in Durban on Monday. The family spokesperson, Sakhile Mhlonishwa, confirmed an assault case was opened. The footage of the incident was apparently from a live Instagram video broadcast she was doing with fans overnight. Although she or someone else allegedly deleted the original video, clips of it have nevertheless been doing the rounds, especially on Twitter, where the videos have trended throughout Monday. Mampintsha has been accused of abusing Babes before. In a radio interview on Metro FM in May 2018, DJ Masechaba Ndlovu confronted Simelane about reports of abuse. The singer did not confirm or deny the allegations. Masechaba was called names and vilified when she outed the alleged abuse Simelane went through at the hand of Maphumulo. Babes Wodumo’s family have thanked South Africa for supporting her and her father revealed that she had been admitted to hospital following the incident.